Hello listeners. 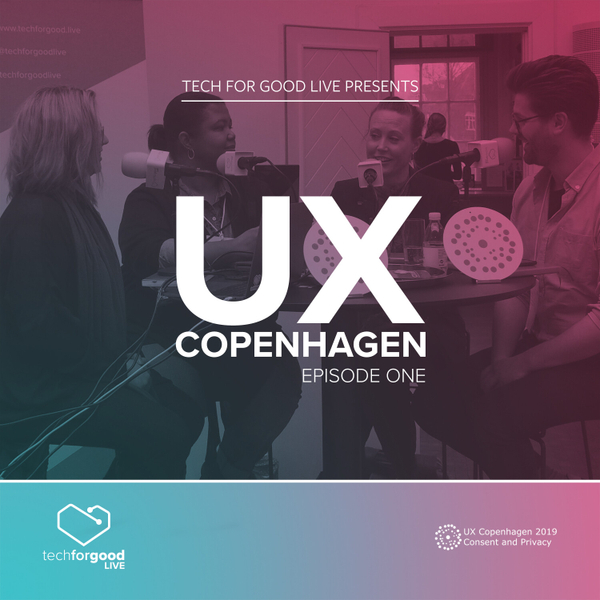 We've been back to UX Copenhagen! This year’s topic was consent and privacy. We were there for both days of the conference and we're bringing you three special editions of the Tech for Good Live podcast with a whole host of fantastic guests. On episode one, joining podcast regular Greg Ashton, Digital Strategist at digital agency, Reason Digital and host Rebecca Rae-Evans, consultant at the design agency Sigma, are Gry Hasselbalch and Nicole A. Cooke. Gry is co-founder of DataEthics.eu. For over a decade, she has worked with the industry, policymakers, NGOs, and end users in the cross field of tech, ethics, human rights, and society. She is also appointed member of the European Commission’s high level group on AI and ethics developing ethics and policy guidelines for AI in Europe. Nicole is an associate professor at the School of Information Sciences at the University of Illinois at Urbana-Champaign. She holds an M.Ed. in adult education from Pennsylvania State University and an MLS and a Ph.D. in communication, information and library studies from Rutgers University. Fancy. Her latest works are “Information Services to Diverse Populations” and “Fake News and Alternative Facts: Information Literacy in a Post-Truth Era”. Look out for episodes 2 & 3 next week. Special thanks to Helle Martens (@snetramelleh) and the UX Copenhagen team for having us back! If you’ve enjoyed listening to this podcast, please drop us a friendly review on iTunes. You can hear more episodes like this, and also some special additions, on iTunes, Spotify and your regular podcast providers. Also, thanks to podcast.co, they know everything about podcasting and host us in a fancy studio in Manchester. You can hire it too, if you’re into that sort of thing. Also thanks to PR Agency One who someone seem to find nice things to say about us. If you want to talk to us or send complaints, which is clearly more likely, our twitter is @techforgoodlive.